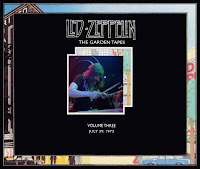 The third and final night at Madison Square Garden used to create the 1976 concert film The Song Remains the Same and the live album of the same name. The tape begins with a brief soundcheck before Rock and Roll explodes out of the gate. Plant's voice starts off a bit rough, taking a few songs to warm up. Following Black Dog, he tells the crowd "this year in America, we decided to work extra hard, so we did two tours... and this is the last night of the last tour" adding "tonight we're gonna do our very best." Page shreds through an excellent guitar solo as Jones explores a funky groove during Over the Hills and Far Away. As the song ends, Plant jokes "really, you could call this gig a fitness test... just to see if we can really still do it." Bonzo hammers at his drums with incredible intensity during Misty Mountain Hop. Since I've Been Loving You is dramatic and powerful. Page blazes through the guitar solos during The Song Remains the Same. Plant introduces Dazed and Confused as "one of the songs from Zeppelin's embryo." The San Francisco interlude is fantastic. The guitar solo/workout section is somewhat erratic. Page solos wildly during the outro. Stairway to Heaven features an excellent guitar solo from Page. The end of the song is met with a tidal wave of deafening cheers from the crowd. Page's fingers fly across the fretboard during the a cappella solo in Heartbreaker. Bonzo and Jones lock into a high-speed funky rhythm as Page works his theramin wizardry during Whole Lotta Love. The Boogie Chillen' section features a fantastic guitar solo from Page. Bonzo plays a thunderous four-minute mini drum solo during the finale. Before The Ocean, Plant tells the crowd "tomorrow night I'll be lyin' on the grass in the middle of nowhere." Following an upbeat organ solo from Jones, the band closes the show with an outstanding performance of Thank You. A fitting finale to the 1973 North American tour. The tape is a combination of two sources. The soundboard tape is excellent. The audience tape is distant and cacophonous. For a fascinating breakdown and analysis of how The Song Remains the Same was created, visit Eddie Edwards's The Garden Tapes. Was this the show where during THANK YOU, the stage on the left hand side began to fall? It seemed the band wanted ONE MORE, but couldn't carry on? Fantastic site. Which of of the 3 MSG nights do you think is the best purely performance-wise ? As I try to get to these shows on anniversaries it's a loose show but a good one none the less. Sounding real good 45 years on. .